SSL G Series Bus Compressor Plug-In, Software compressor from Universal Audio in the UAD Plug-In series. chrislieck's review"Great for MASTERING "
I have the hardware unit of this device. I have used it for 6 years and used SSL for 20 years. This plug in is very close to the $6,000 unit. I only use this for sub mixes and mastering. I don't use this on much else than mastering and overheads or sub mixing drums. If your input is hot in level you can really hear the compression kicking in. There are shelved settings and variable knobs like the unit. But it is not like the original and few can say they own the original. I have heard many people say they use this on a vocal or a snare drum. I only use the SSL channel strip for that. I don't use this plug in for snare or kick or toms. This compressor when used on kicks for example it won't be heard unless you hit the compressor hard and so to me it is not effective when used that way and I don't like the use of this plug in or the hardware unit for much else other than overheads on drums and room mics depending on what mics I have used to record the room sounds and or overheads. I like to allow some transients through and attack the compression with at max a 4:1 compression setting. I am not a fan of this unit on mastering. It is one of the best units for mastering you can use but very few are familiar or have ever used this unit so they just play around with it and use what ever they land on. I use this plug in for mastering all the time and it is my favorite go to piece or plug in I have. I have used it for 4 years the plug in and the real unit for 6. Love it and it is stable, performs as advertised and sounds as advertised. I have spent 10 years using SSL for mastering so with the release of this product I was happy to find that it is very close to the original hardware piece. I like the fact that the make up gain has head room and that fact that when you have on a buss it has a real subtle effect for grouping drum compression or if I use it on backing vocals so long as they are grouped and compressed lightly. SSL has a specific tone and if you have worked on one you will know what I am saying. For mastering it is must have and for soft compression on sub mixing it is a must have. This is an industry standard for most pros who like to use professional sounding compression. If you have no experience with SSL it is a good place to start. I like the fact that you can make the compressor sing by hitting it hard but you can also have a soft compression if used on a buss send and aux return. 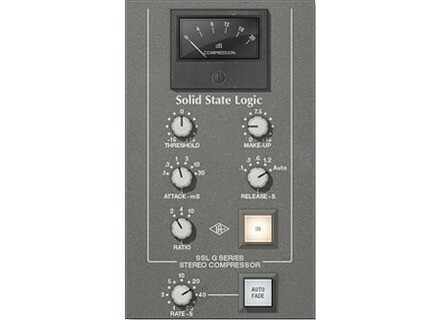 For mastering I use it on a buss so that I can control the compression. loudfunk's review"Ideal for guitars and drums..."
Authorisation file download and ready to go as with all UAD plug-ins. Runs rock solid on my OSX lap top and Vista desktop. The SSL G Series Bus Compressor plug-in for UAD-2 is an incredibly faithful circuit emulation of the legendary SSL 4000 G console’s bus compressor. The undeniable drive and punch of this G Series master compressor — modeled to exacting detail by Universal Audio and fully authenticated by Solid State Logic® — helped make the original 4000 G Series the world's most success- ful studio production console. Engineers have come to rely on this master com- pressor to “glue together” mixes like nothing else, as well as patching into it for wonderful results on drums, pianos and more. With simple, intuitive controls and transparent compression characteristics, the G Series Bus Compressor plug-in for UAD-2 captures the iconic SSL sound with stunning accuracy. Plug-in controls comprise fixed Compression Ratios (2:1, 4:1 and 10:1), and Attack and Release controls with program-depen- dent Auto Release function. Continuous Threshold Control and Make-Up Gain, compressor bypass, and the original Auto Fade (1-60 seconds) feature provide full operational authenticity. The SSL G Bus compressor has been used to put the final touch of cohesive- ness or “glue” to more mixes than any other compressor in history! Its true use- fulness and beauty is usually in its subtle ability to make your mix “pop” just a little more, with a subtle increase in energy and excitement. Traditionally, the SSL G is most commonly used from the beginning of the mix process, and the engineer is “mixing to” the sound and behavior of the com- pressor. The ideal way to audition this plugin is on a new mix, dropped into an insert on your stereo master fader. In this case, you will be spending a lot of time keeping an eye on gain reduction metering and you may make tweaks to the setup as the mix progresses. Of course it can also be dropped in exist- ing mixes at any time, but keep in mind it may take a bit more effort to dial in, especially if your ear is already used to the sound without its compression properties. 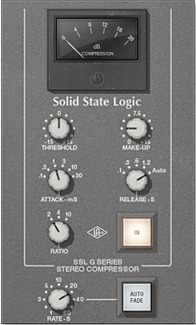 The SSL G is also useful of groups, such as drum busses. in this case, a more aggressive approach may be appropriate, with a greater range of gain re- duction. 10:1 will give a harder sound often desired for drum groups. Fast at- tacks releases will give the most audible sound of the compressor working. Finally Auto Fade is useful when the end of a song needs a gradual decrease in volume. The speed of the fade can be tuned from 1 to 60 seconds, and in- corporates SSL's unique fade curves. fade in is also available.